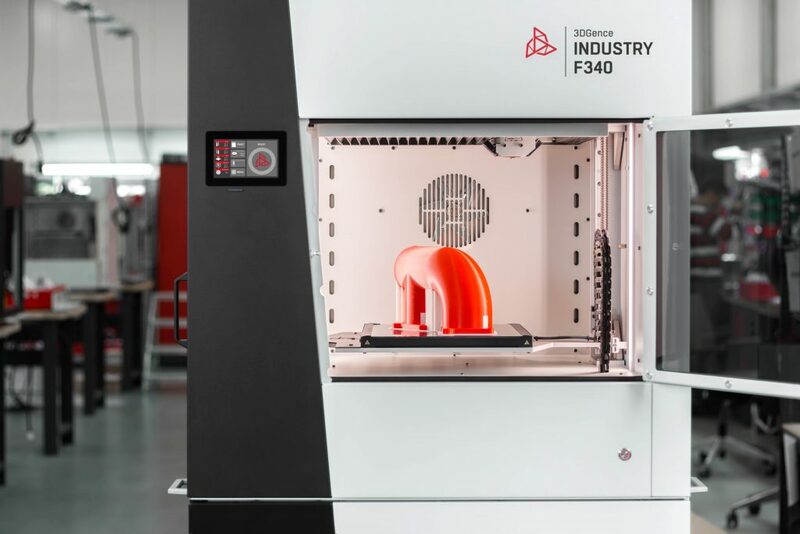 The 3DGence INDUSTRY F340 is a dual nozzle industrial 3D printer suitable for working with a range of functional materials including the high grade thermoplastic PEEK. 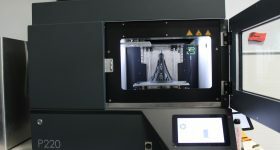 3D Printing Industry recently visited Poland to test the 3DGence F340 and find out if this industrial additive manufacturing system lives to the manufacturer’s claims. 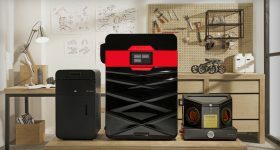 As an FFF/FDM 3D printer the 3DGence INDUSTRY F340 is targeted towards applications ranging from production to prototype in a variety of industrial workplaces. 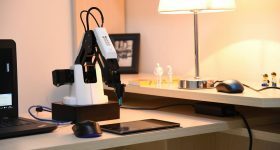 Our review found that this 3D printer was meticulously engineered and easily able to handle any task, producing reliable and repeatable 3D prints time after time. The 3DGence INDUSTRY F340 industrial 3D printer. What separates the INDUSTRY F340 from the crowd is its ability to create high quality, very accurate and detailed prints effortlessly with any material fed in within the range. Furthermore, the 3DGence INDUSTRY F340 has a patented extruder with a modular design. 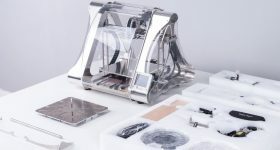 This multi-material 3D printer can use the vast majority of available filaments on the market. These range from standard materials such as PLA, to high temperature thermoplastics including PEEK. Multi-material capability on the F340 is a matter of simply swapping the extruder modules, says the manufacturer. 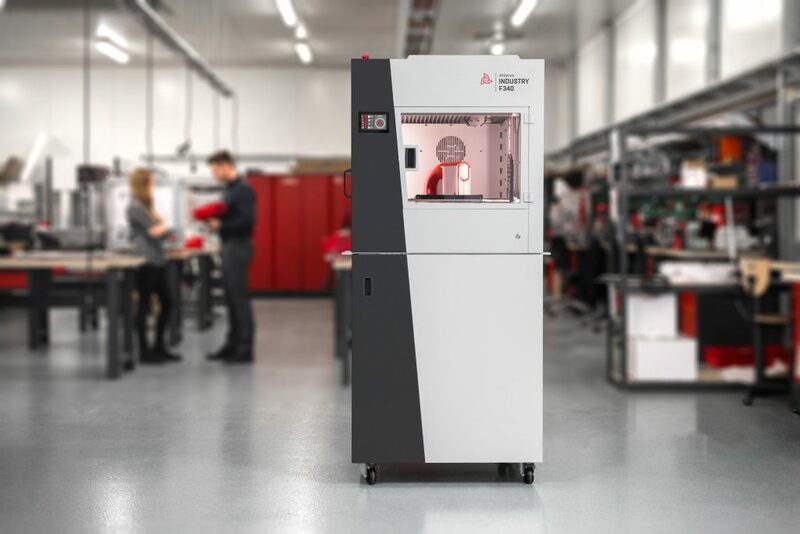 Fundamental to the capabilities of the F340 are four core components, the interchangeable printing modules, a controlled printing environment, smart material management and the heated material storage chamber. 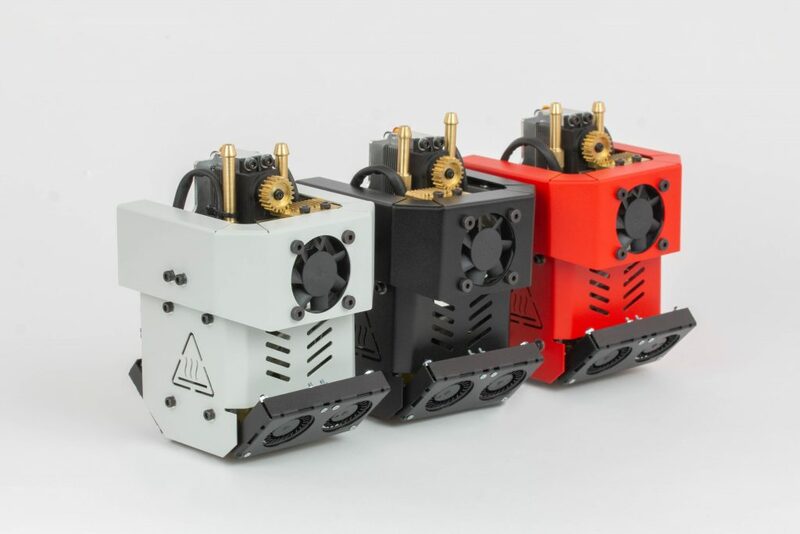 The 3DGence INDUSTRY F340 features the option to use three different variants of an interchangeable hotend assembly or printing modules. The PRO, HT and HTmax modules are each specifically designed for a particular range of filaments. This allows users to select the suitable module for a project. [L-R] The 3DGence PRO, HT and HTmax interchangeable printing modules. We tested all three modules with the manufacturers recommended settings using the 3DGence Slicer. The process for switching between the modules is very simple, and is well documented in the user manual. This task is quickly accomplished and a user would find it very easy after the first use. ABS test print done with HIPS support material. Photo by 3D Printing Industry. A second, and very important, feature incorporated within the machine is the controlled printing chamber environment. The printing chamber is actively heated using heating fans. Furthermore, the temperature is monitored and can be controlled using the touchscreen interface. 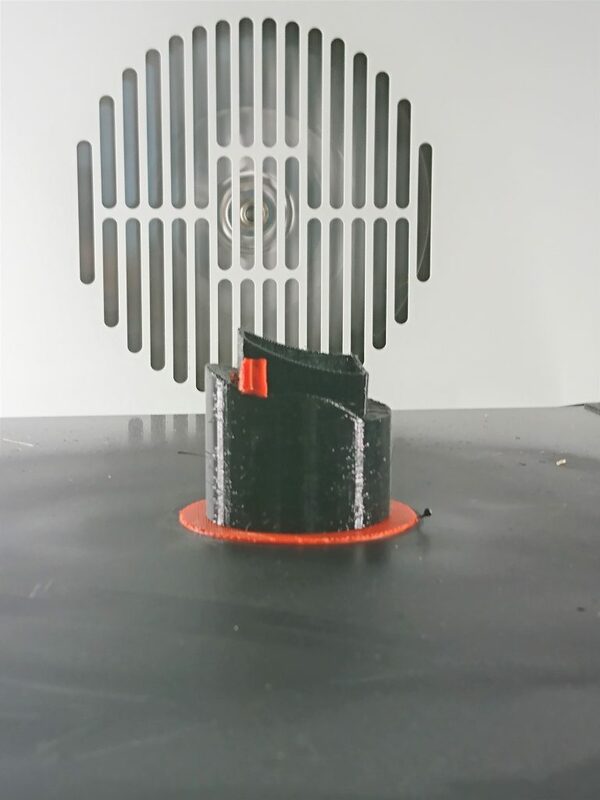 This feature is impressive, but also vital when printing with high temperature thermoplastics such as PEEK. 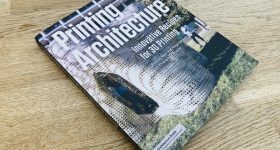 Even when working with a material like ABS the temperature stability and degree of control leads to enhanced prints and dimensional stability. 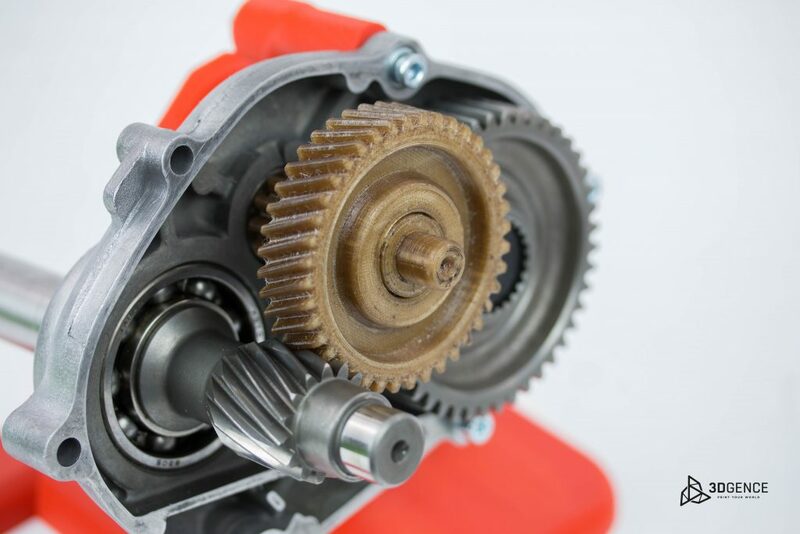 For example, a functional gear design we printed with ABS filament as a test sample came out remarkably accurate and did not require any additional post processing. 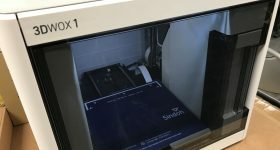 Furthermore, large industrial grade air filters protect the operating environment outside of the printer from fumes or odours that might be produced during 3D printing. Smart Material Management on the 3DGence INDUSTRY F340 is a set of intelligent features constantly running on the printer’s processor. This includes recognising the material being fed into the printer using an NFC tag reader, the printer then uses the specific pre-set settings for that material from the Certified Material Base (a library of materials and their printing parameters which have been tried and tested successfully by the manufacturer) stored inside the printer’s memory. Material flow controlling is another significant feature within the system and continuously monitors the flow of the material being extruded during the printing process. This feature reduces the chances of failed prints by pausing the print when the system detects a deficiency in material feed. The other features within the system are material detection, material weight calculation and automatic material feeding which are very useful and convenient respectively. Another great feature incorporated in the INDUSTRY F340 is the ability to keep the materials being printed under heated environment. 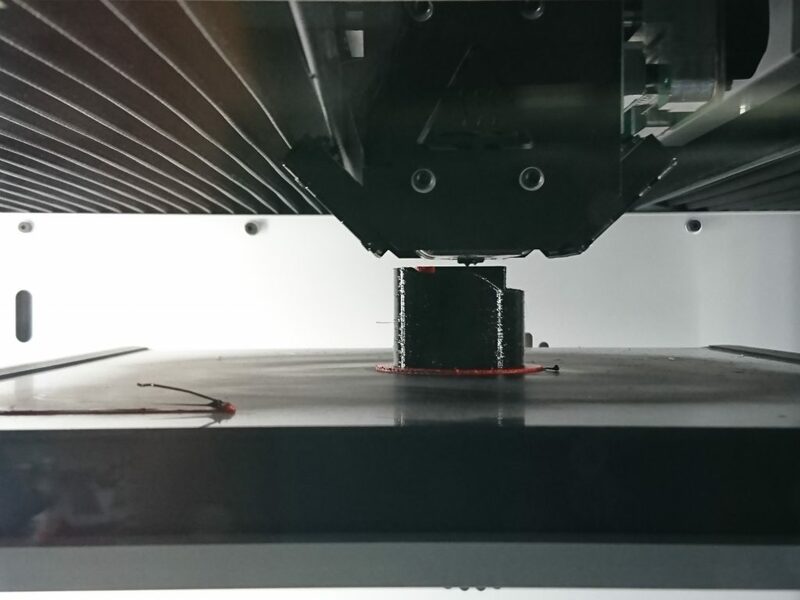 As commonly known, many 3D printing materials are vulnerable to moisture, for example, ABS, BVOH, HIPS and Nylon. The later material is particularly well known as extremely hygroscopic. Therefore the heated material chamber feature is a useful addition when printing with high temperature thermoplastics such as PEEK. Having a heated material chamber will reduce the moisture effect on the material and further improves the quality of the prints. This feature can also remove the need for length pre-printing preparation of materials – such as separate drying. The 3DGence INDUSTRY F340 Heated material chamber. Photo by 3D Printing Industry. 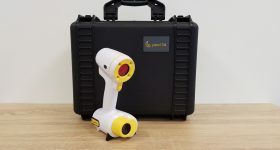 What we especially liked about this feature is that the chamber temperature can be controlled via separate interface, which means users can dry almost any material by leaving them inside the chamber at a suitable temperature. In terms of hardware, the 3DGence INDUSTRY F340 is constructed to industrial standards, but also presents attractive design features. The INDUSTRY F340 is immensely robust and sturdy in its build which helps the printing process in various ways such as low vibration, precision in movements and accuracy in dimensions. The X, Y and Z gantry both looks and feels tremendously robust. Such sturdy construction benefits accuracy in 3D printing, however it is also required to support the hefty direct driven extruder mechanism. And while the extruder mechanism is substantial, the F340 is engineered in a manner that benefits from what a first sight may seem overly-heavy. In our experience the F340 is more than capable of printing precise and accurate objects at a decent speed level. The platform is supported by two industrial grade threaded rods providing the sturdiness. Furthermore, two linear guides provide accuracy during movement. As the F340’s chamber temperature can reach upto 85˚C, a system to protect the electronics is necessary. 3DGence accomplishes this task by using insulating bellows. The bellows around the extruder mechanism are remarkable in keeping the chamber heat within the chamber and as well as protecting the gantry mechanism from the heat to increase the parts service life. Insulation bellows around the extruder head. Photo by 3D Printing Industry. We had a small issue with the filament guide tube. The tube dislodged itself from the push fit coupler twice during the whole testing process when the filament was being fed, causing filament feed error shown on the display. This was rather a small issue, nonetheless, the manufacturer’s team took it into consideration for any possible improvement. Once we had inspected the construction and mechanical elements of the 3DGence, we were pleased to note that the auto-calibration feature was also up to stand and found to be very reliable and quick. We then moved onto the electronics and the slicing software used by the F340. The 3DGence slicing software can be downloaded from the manufacturer’s website. It is based on Cura slicing engine but heavily modified to suit the 3DGence product line features and needs. 3DGence recommends use of their provided slicing software for better print quality and reliability as the Certified Material Base is regularly updated and modified. We had a chance to meet the R&D team and get an further insight, the team showed us the tests being carried out regularly with existing and new materials to find the best printing parameters and improve the existing ones. The dedicated team has completed a substantial amount of testing work here, and our review found the work was approached in a methodical and logical manner that yielded good results and a substantial volume of material profiles. A PEEK 3D print from the 3DGence INDUSTRY F340. So far in testing the 3D printer our engineer had only glowing comments to make about the F340. However, the current iteration of the slicing software did prove to be a minor stumbling block – not for ease of use nor lack of function, both of which were more than adequate – but the speed of a slicing calculation was a minor drawback. We understand an update has recently been made to improve speed of slicing and work continues in this area. The electronics in the F340 are a proprietary design. There are plans by 3DGence to modify the design with a 32-bit processor for enhanced reliability and speed. The primary reason for this change is to provide resources and power to increase speed and avoid any stalling during intense calculations. This will undoubtedly enhance what is already a very well put together system. Access to the electronics and other gantry parts are convenient and users can simply troubleshoot under the manufacturer’s recommendation when needed. The INDUSTRY F340 uses the Repetier firmware at core, which has been re-written substantially to include further features such as custom G-codes. The firmware seems to be stable and can be updated to the latest version by following the instructions in the user manual when available. The F340 user manual reflects the high quality and standard the company follows. It is well structured, fine attention has been given to the details and content. The manual covers all the necessary information professionally, including the safety measures, first set up, touchscreen options and troubleshooting etc. We followed the first set up instructions from the user manual and completed the set up without any issue. Using the supplied 3DGence slicing software and the available profiles to begin testing the printer with ABS along with HIPS as support material we began our first 3D printing tests. The print came out beyond our expectations, with great detail and accuracy as anticipated from the well constructed machine. There were no defects, warping or cracks noticed in the print. At this point it should be noted that care in the selection of SD cards is advisable. This industrial grade machine requires industrial quality SD cards – a point clearly outlined in the manual. Failure to observe this point, can (and in our experience did) result in a failed print. Verification of the F340’s build volume of 260 in X axis and 300mm in Y axis was tested. An initial limitation imposed by the slicing software was remedied by a software update, and a good opportunity to check in with the 3DGence support team who were professional, friendly and knowledgeable during every interaction we had with them. 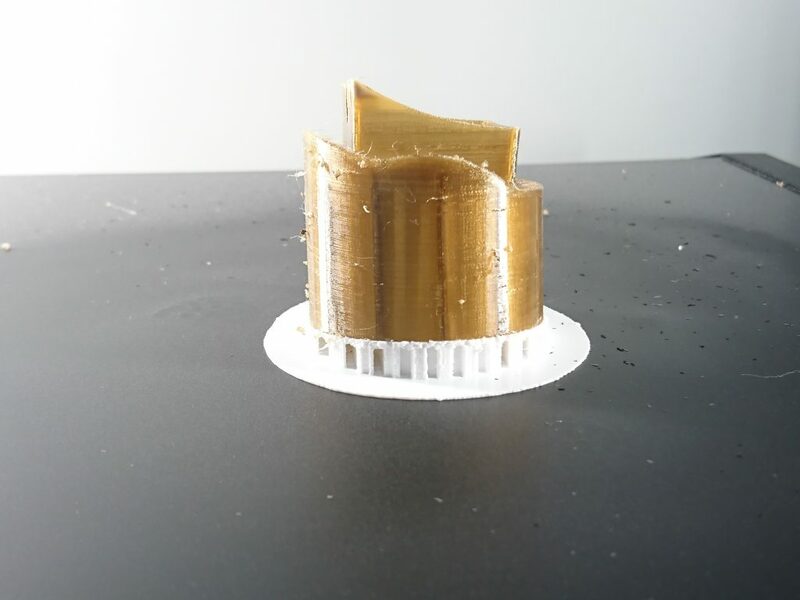 Having verified that the 3DGence F340 performed well with ABS and HIPS using the PRO extruder module we moved onto some more demanding applications. The extruder module was then swapped with the High Temperature (HT) module by following the instructions in the user manual, a simple and rapid task. 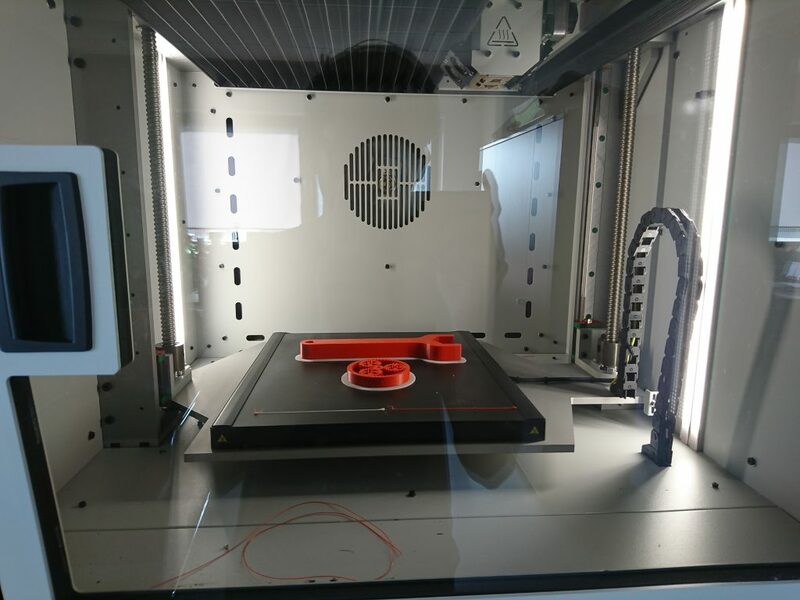 We chose to print PC material along with ABS material as support. The first attempt did not yield a satisfactory result. 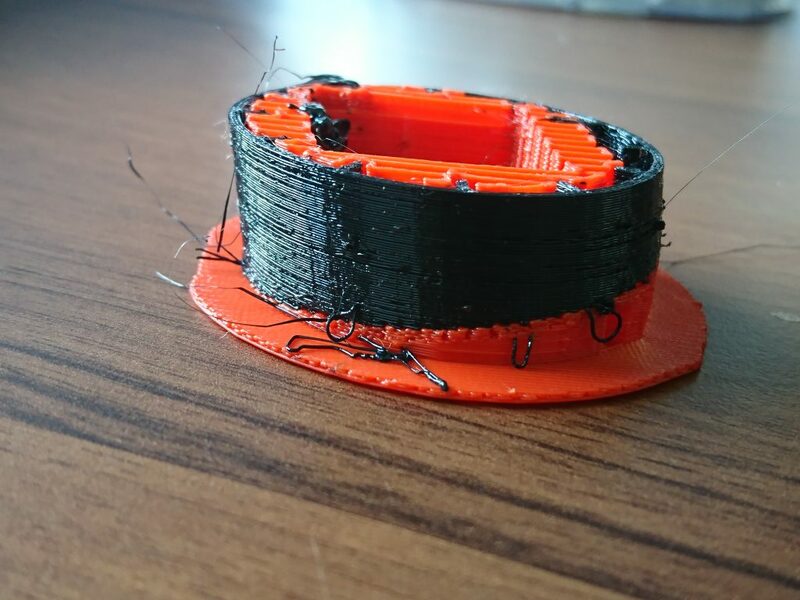 It looked like the nozzle printing with PC was partially clogged resulting in very badly under-extruded layers. First attempt printing PC with ABS support material. Photo by 3D Printing Industry. We then cleaned the nozzle by inserting a hypodermic needle whilst the nozzle was heated to remove any blockage as per the manufacturer’s instructions. Fortunately, that helped and then next attempt yielded a very good outcome. The second attempt to 3D print PC with ABS, a very good result. Photo by 3D Printing Industry. The PEEK material was left to dry inside the material chamber to prepare it for printing the next day. The instructions are given in the user manual under the topic 1.4. The HT module was swapped with HTmax module to test the PEEK material along with the breakaway support material. 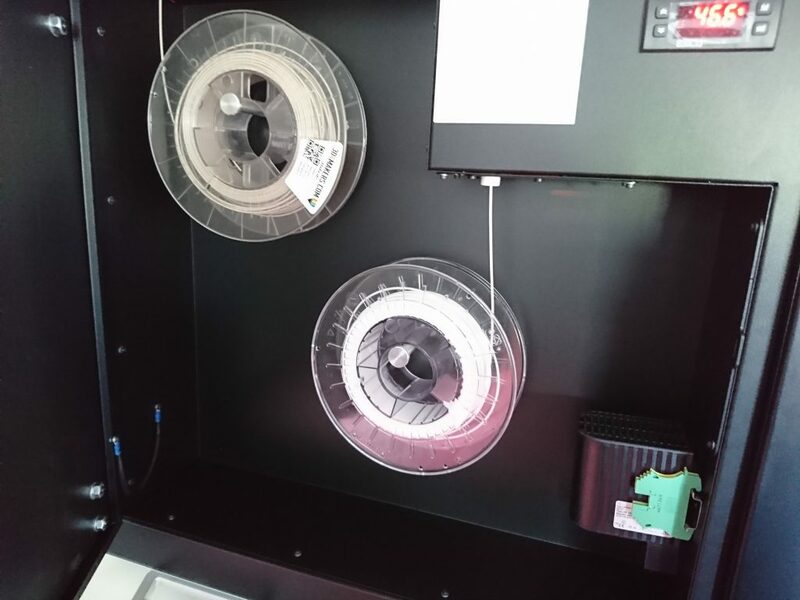 We were very impressed by the quality and the reliability of the printing module to print PEEK filament with such a level of ease and comfort. The support was also easy to remove from the object. PEEK filament test along with breakaway support. Photo by 3D Printing Industry. The model coming out of the printer displayed effective overhang handling capability reflecting on precise control over the temperature and air flow. 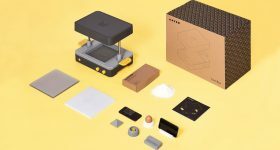 In our opinion while 3DGence does provide some instructions and specific recommendations for 3D printing with PEEK, a little more information regarding printing with PEEK material is required either as a knowledge base on the website or include it in the user manual. For example, design requirements/limitations, annealing process and information on the material characteristics obtained under industry standard tests from parts printed on the printer. 3DGence engineers were all very knowledgeable about these topics, and while many users who require PEEK functionality may already be familiar with the material – sharing this additional knowledge could still prove to be beneficial. A gear 3D printed in PEEK on the INDUSTRY F340. In conclusion, the 3DGence INDUSTRY F340 is carefully designed, mechanically and electronically an exceptionally well built device. Based upon our testing experience, it is one of the best professional 3D printers on the market at the moment. Potential buyers should be assured that the F340 delivers on the manufacturer’s claims. During our discussions with management and workers it became clear that 3DGence has a great understanding of additive manufacturing. The openness and level of engagement with customers seeking to use their choice of materials within the acceptable range is what separates 3DGence INDUSTRY F340 from the rest of the industrial printers currently available in the market. With ongoing improvements to hardware, software electronics wise as mentioned above the printer is expected to be the best choice for the industries the manufacturer is aiming for. 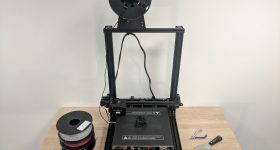 For any 3D printer user, it is very important that the manufacturer be there with them after sales, either for technical support or to listen to their experiences. 3DGence does exactly what is expected from them, we had a chance to evaluate after sales services provided by them and we were pleased by the level of support provided by the extremely knowledgeable team. The team seem prepared with professionally well-prepared instructional guides and video instructions where necessary. 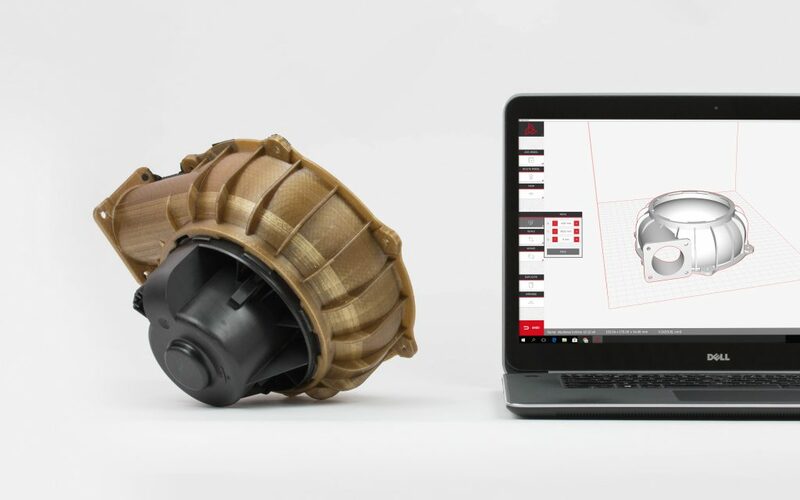 Whether your company requires the ability to 3D print in PEEK or not, the 3DGence F340 should be a strong contender inclusion in a workgroup. 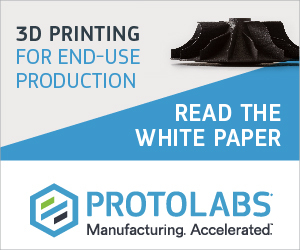 In their quest to engineer a machine capable of handling higher grade thermoplastics, 3DGence has created a 3D printer that excels with more widely used materials. We expect to see the F340 earning a place at many more companies soon. You can find out more about the 3DGence F340 here and order sample 3D prints here. 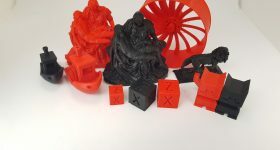 3D Printing Industry also recently tested the 3DGence DOUBLE, read our review here.